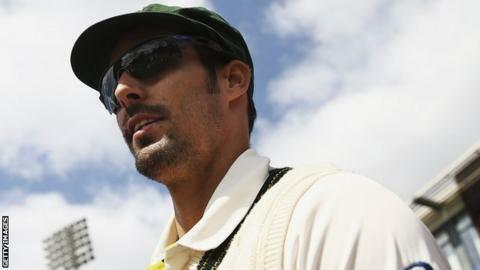 England can win the Ashes without Ben Stokes, says former Australia fast bowler Mitchell Johnson. All-rounder Stokes was arrested on 26 September on suspicion of causing actual bodily harm following an incident near a Bristol nightclub. The England and Wales Cricket Board has said the 26-year-old will not travel to Australia "at this stage". "I don't think you can read too much into what people are commenting on 'no Stokes, no England'," Johnson said. England fly out to Australia on Saturday and begin their defence of the Ashes in Brisbane on 23 November. Speaking on BBC Radio 5 live's Tuffers and Vaughan show, Johnson added: "I think England can win without him. I think at a contest at that high level, anyone can win. "If you're Australia, you don't want to be thinking they can't win because Stokes isn't there - that can bite you in the backside pretty quickly." England will be attempting to retain the Ashes in Australia for the first time since 2010-11, although the hosts are favourites to win the five-match Test series. Stumped podcast: Is comparing sport to war ever justified? Johnson was a key part of Australia's last home Ashes victory, taking 37 wickets and dominating England with his pace in the 2013-14 series. Fast bowler Mitchell Starc has said the current side will look to emulate Johnson's performance, while vice-captain David Warner has described the series as a 'war'. Johnson, who retired from international cricket in November 2015, said he expected Australia to target England's inexperienced players with short, fast bowling. "I'm still confident that Australia can win the series, but the performances recently haven't been great from both sides," the 35-year-old added. "The wickets are a little bouncier and faster, so some of these new guys might find it harder, and that's where the Australian bowling attack is strong." You can hear more from Mitchell Johnson on the Tuffers and Vaughan Cricket Show on Monday, 23 October at 21:00 BST on BBC Radio 5 live, and also on a special programme on 7 November looking back at the last Ashes tour - Pomnishambles: The Inside Story of the 2013-14 Ashes Whitewash.